Presenting a performer with a bouquet of flowers after his performance is traditional and thoughtful. Whether you're seeing ballet, opera, musical theater or the orchestra, flowers are an appropriate gesture (and inexpensive gift) for both male and female performers. Choose flowers based on the performer's favorite colors and flowers, picking sturdy flowers that will hold up and are within your budget. To ensure the performer receives your bouquet, find out the venue's policy on flowers beforehand, then make arrangements. Contact the venue where the performance is taking place. 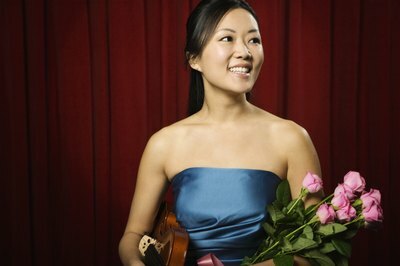 Let the spokesperson know you intend to give flowers to a performer the night of the concert and find out the best way. It is generally acceptable to send flowers backstage before the performance or deliver them onstage afterwards, according to Dr. Dave and Dr. Dee. However, certain venues may have preferred protocol. Call or visit local florists the week of the performance. Pick out the type of bouquet you want to present. Mention the artist's favorite flowers or colors or select from the prepared bouquets. Then pay and arrange delivery. Provide the performance venue, time and any special instructions the venue representative conveyed. Be sure to write a message so the performer knows whom to thank. Visit a florist on the eve of the performance to buy a bouquet, should you prefer to deliver it personally. Linger after the performance with your flowers if you're delivering. Wait in the hallway or atrium or access the backstage area or dressing room. If you know the performer well, and this is a small venue, it will be easier to get backstage; if it is a large theater or you're a stranger, you're better off waiting in a public area. 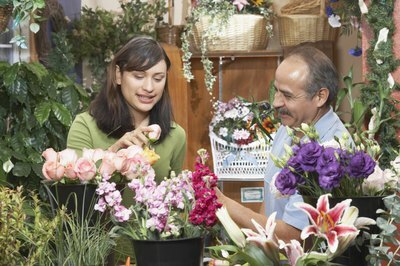 Hand the flowers to the performer when you see her, or find an employee who will deliver them on your behalf. If you're seeing multiple performances, consider giving one small flower after each one and a large bouquet on the final night. This way, you don't overdo it financially, but still acknowledge a job well done.